CES 2015: Harman reveals HALOsonic noise-cancelling and ISZ in-car technologies | What Hi-Fi? Harman has unveiled new in-car technologies designed to reduce road and engine-noise and to bring personalised zones for driver and passengers. Sick of your car's sat-nav interrupting your favourite tunes? Harman's new ISZ (Individual Sound Zones) could, therefore, be right up your street - this new in-car technology, announced at CES 2015 allows for greater personalisaton of a car's interior space. With this technology, you can create your own zone - for example, only the driver gets voice prompts from the sat-nav system while passengers get uninterrupted music playback. Harman claims it maximises speaker directivity and minimises crosstalk in and between zones, using it to suit someone's position in the cabin and whatever media they want to use. ISZ uses tiny speakers positioned in the headrest and Electro Dynamic Planar spakers in the vehicle ceiling to help create the individual zones. 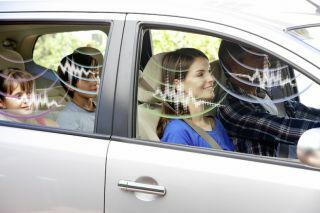 The technology doens't completly remove sound from other areas of the car, Harman claims ISZs just allow for less interruptions and distractions. Engine Order Cancellation (EOC) - claims to reduce drone and rumble of a car's engine; it uses microphones fitted into the cabin to monitor and alter the noise cancellation in real-time.